New WUWT ENSO Forecast Page, Underwater Upgrades to the WUWT ENSO Page and a Disturbance in the Equatorial Atlantic | Watts Up With That? There are also several upgrades to the WUWT ENSO page, including new Sea Temperature Anomalies at depths. Lastly, WUWT reader “tim” points out in comments of the WUWT Ocean Page that “everybody is focusing on the Pacific at the moment, but “in the central Atlantic around the 10th may there seemed to be a large disturbance in the SST lasting around 2 weeks.” Animation to the left and analysis below. With these warnings applied, all of the ENSO forecasts above, as well as an array of others, can be found on the new WUWT ENSO Forecast Page. Note how the area of large positive Sea Temperature Anomaly first appeared in early February at a depth of 155 meters, centered on longitude 160W. 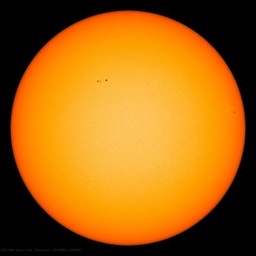 By late February had risen to 105 meters, centered on longitude 135W and by mid March had risen to 55 meters centered on 95W. Please note that WUWT cannot vouch for the accuracy of the data within the Reference Pages, as WUWT is simply an aggregator. All of the data is linked from third party sources. If you have doubts about the accuracy of any of the graphs on the WUWT Reference Pages, or have any suggested additions or improvements to any of the pages, please let us know in comments below. Thanks for the great animations and all the work that went into them! Fascinating! However, as I look at them, I am reminded of the investors who stare endlessly at various financial time history plots, trying to divine future trends. With both the markets and climate/weather as fundamentally chaotic systems, that is probably a fool’s errand. That report was from 2011!! and the island is at latitude 27.7°N! http://earthquake-report.com/2011/09/25/el-hierro-canary-islands-spain-volcanic-risk-alert-increased-to-yellow/ shows that there’s essentially nothing going on. This is not the volcano you are looking for. When you first look at the animation, it looks like the “disturbance” was bubbling up from below and not related to currents moving. If it was volcanic, wouldn’t there be seismic readings from both sides of the Atlantic that could pinpoint it’s location ? Understood, this reference was included, along with the other citation from 1838, as a comparative reference of submarine volcanoes and their effect on the Ocean surface. I’ve added years to both references within the article to make clear that these are not examples of the event that occurred in May of this year. If it was volcanic, wouldn’t there be seismic readings from both sides of the Atlantic that could pinpoint it’s location ? that was much further to the West of the disturbance. Could there be a corruption in the data to eplain the “upwelling” we see on these animations? Was there a huge thunderstorm event there at that time? The ocean ends up cooler afterwards. Certainly a possibility, but if this is the case it is strange that the corrupt data shows up in different ways and time frames on the Sea Surface Temperature, Sea Surface Height, Speed / Currents and Sea Surface Salinity animations. Jaxa’s Gosat, Ibuki, is tracking CO2. Did they notice if the Atlantic Ocean belched? Gaseous subaqueous emissions would reduce buoyancy in the water column above the origin of the eruption. The consequence for shipping could be catastrophic. The disturbance covers a very wide area – extending 12degrees west to 27 degrees west in a very short period of time (less than 1 day) – would that not imply either a data problem or a meteoric disturbance? For it to be volcanic it would need to be enormous or very fast currents! I suspect it’s an uncorrected anomaly in common satellite-based data. I’ll take a look at the Reynolds OI.v2 SST data when they update it next, hopefully tomorrow, to see what it looks like…if it shows up. Just The Facts, thanks for the new WUWT ENSO Forecast Page. The ENSO Forecast Page is very informative. My model predicts it will it get warmer or go dark before the night’s out. “… for Climate and Society” . Sounds like a totally objective scientific venture, not. When I first saw that disturbance I shrugged it off as some data glitch, because it is so huge the cause would hard to go unnoticed. Now I’m wondering. Perhaps it is a glitch caused by some event in the upper atmosphere that would effect the readings a satellite was getting. This mystery will be interesting to follow. The disturbance of of Africa is right on top of the Camaroon volcanic trend. Well, almost all of my thoughs on the disturbance in the Atlantic have been covered. Has anyone scaled it for size? Now, what about plankton or algae blooms?? It’s helpful to save the animations and use a tool like GIMP to resave them with different frame rates. I set it to 2000ms per frame (every frame) and you get chance to focus on what happens at least. I noted in the salinity anim. that the Gulf of Guinea shows activity just before the mid atlantic event. 12th pulse near to africain coast 7-8 east; 13th quick flash 5W half way to central zone; 14th quiet; 15th,16th mid-atlantic disturbance 15W. Coastal zones remains low salinity until near to end of month then anomaly contracts. Like Caleb, I initially dismissed this a curious glitch but this tends to go against that. It’s a different time-scale , affects different areas and a different measurement. I think that argues for a real physical event. A volcano is the obvious thought but if there was not recorded activity that seems at least in doubt. Also the size of the zone affected is huge. It’s not just a squirt of bubbles making it to the surface. There was a solar eclipse on 29 April so this 11-16th period was around the following full moon when solar + lunar tidal forces add. Near equinox so both are focuses in tropics. Closest perigee was 23 April but still very close at this time. Stronger than usual lunar tidal force. I guess all these things we are looking at are ‘anomalies’. Could this be a sub-surface standing wave (tide) reaching higher than usual magnitude due to alignment of tidal forces? It certainly came and went very quickly. JTF, are those actual observations or modeled data? On the Atlantic event, I have a collection of AVHRR OISST stills here. It’s high resolution; you can get down to 1/4°. You can choose days, rotate etc. I couldn’t see anything unusual on 9 or 10 May, or nearby days. Last year was there very large eddies of sinking warm surface water down to över 500 m in this area of the Atlantic. Those eddies lived for about a week. This disturbance may been an usuccesfull establishment of a eddy. Yes, it looks to me like a disturbance in the NRL modelling. A checkerboard instability, with an alternating pattern, fading rapidly as it loses energy in shallow water. As I mentioned above, I can’t see anything in the AVHRR observations. If this is indeed satellite based measurements in which one must peer through the atmosphere in order to measure oceanic things, what would it look like if a large explosion in the atmosphere occurred? And then the satellite picked up those signals, incorporated it into the model component of the program, and ended up with what you see above? There was an M5.6 earthquake on 2014-04-30 15:52:40 UTC north of Ascension Island (1.184°S 13.455°W depth=10.0km) followed by smaller quakes throughout May, including an M5.1 one on 2014-05-16 21:11:29 UTC (10.396°S, 13.234°W depth=10.0km). Looks like an entire section of the mid Atlantic ridge is on the move there. With a RAF airbase on Ascension Island, used by the Americans and a NASA Tracking Station at Devil’s Ashpit I am sure it was closely monitored. Pretty much everything related to the island is classified, I have no idea why tectonic processes should be included though. That was a vast area of ocean, currents don’t act like that and, water simply doesn’t mix that quickly. The arrival of some super hot/super cold water would have left traces which would have remained visible for much longer. This ‘anomaly’ vanished in a day, so it is indeed anomalous! DAL SITO: http://bulletin.mercator-ocean.fr/html/produits/psy4qv2/welcome_fr.jsp NON SI VEDE NULLA DI STRANO, MA POTREI ANCHE SBAGLIARE. If it was a volcano, maybe it produced pumice which would be quite hot then rapidly cool as it floats to the surface, then would be rafting its way to some distant shore. The 2014 El Nino is looking more and more like a mild/moderate summer off-typical-timeline event. The thing is when the heat dissapates, the equatorial Pacific will then be a big cool-spot along its entire length. A La Nina is then likely to develop which will then offset any global temperature impact by next spring 2015. Up and down and up and down. This is what the ENSO is. Could a change in one part of the equation affect resulting data long term. I have asked several times how these changes in methodology impacted observational outputs. To date, no answers……. just curious in the end. I’m with Barnston for this year’s “el Nino” being weak. 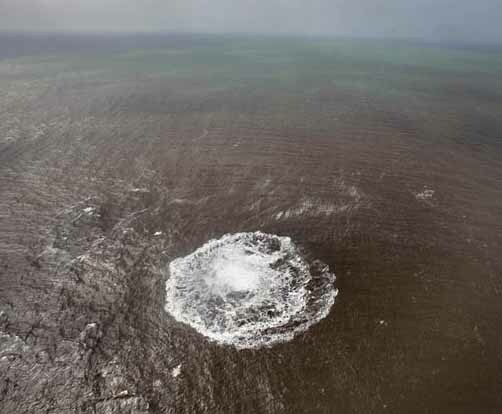 As for the disturbance in the Atlantic, if it’s a volcano it’s pretty damn big. This is where interhemispheric heat piracy takes SH heat to the NH by the trans-equatorial current becoming the Carribean current. If this is disrupted or changed it could have global climate implications. Did someone just test a nuke? The Atlantic temperature, sea height, current, and salinity observations for the period May 27-31 are the most interesting. 🙂 If you can explain them, then you can explain the disturbance around May 14. There was a spike in the solar wind speed and temperature between the 23rd and 24th. That area is also exposed to the South Atlantic Anomaly. So…data corruption likely. As far as next El Niño goes, this evidence should be considered. Kevin is engaged in wishful thinking. This el nino is already proving not as powerful as the 97 el nino, failing to hit similar targets at similar points of its evolution. How powerful it will be, ultimately, remains to be seen yet. ‘How powerful it will be, ultimately, remains to be seen yet.’, yip, but all the signs are pointing to a big El Nino! A case of wait and see, which will not be to long off. The feedbacks (Westerly Wind Bursts and general weakening of the trade winds) are going to have to kick in if that’s going to happen. So far, they are no where near where they were during the evolution of the 1997/98 El Nino. NINO1+2 region sea surface temperatures, as a result, are presently about 1.0 deg C lower than where they were during this week in 1997. Not only that Bob, but because the current el nino is unfolding in a similar way as 1997, you can just compare them at similar stages. 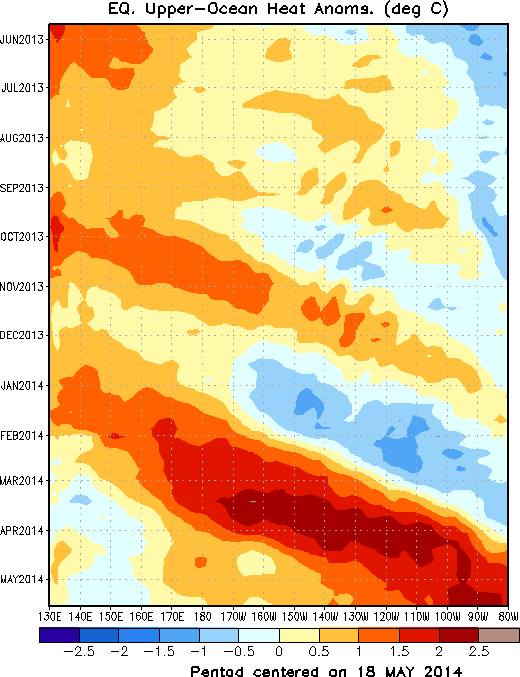 So far, this el nino is failing to reach 97 levels. With each week the discrepancy grows. That’s a fact. Let’s keep in mind as well, in 1997 there was yet another kelvin wave that increased temperatures even further in the summer. If that doesn’t happen, this el nino will come no where close to 1997. The kelvin wave was the only thing that even suggested a strong el nino to begin with and now that it’s surfacing we can see it’s not creating 1997 type temperature increases in the ocean. Ocean temperatures are not rising as high, or as fast, as they did in 1997. The kelvin is waning as it surfaces as well. The winds are not cooperating at all and even many of the more “optimistic” models (predicting strong el nino) are pulling back. The models, as of now, are calling for a mild el nino. Something else will have to happen to give this el nino a kick start. It’s becoming more and more obvious this won’t be a very powerful one (ala 97 or 83) but it could still be a 2010 type event. Let’s see. I would hardly say that all indications point to a strong one. There were a few indications, a couple of months ago, but many of those have not materialized. Living here in central Ca, I am hoping for a strong enough El Niño to alarm the alarmists . The precipitation it would bring will surely be another example of “Climate Change” as well as climate change. I will suffer those fools in exchange for the rain. I am hoping for at least 20 in of rain next water year. It is not too much to ask for. I believe the effects of the negative PDO will work toward a weaker ENSO event than predicted. Does anyone know of research on this point? I am completely mesmerized by the anomaly. I’m also fascinated while watching my hard drive being de-fragged. The volume of seawater, being churned in a few days is just amazing. The speed of the rising cold water volume from 10,000′ below sea level, with an area the size of the Philippines. 90,000 cubic miles of water moving vertically at about one mph..
Say how many horse power would be needed to duplicate this event?…. What PC operating system do you use?